The Trail Blazers won Game 4 of the First Round, 111-98. Portland leads the series, 3-1. The 2019 NBA Playoff schedule will be announced following the conclusion of the regular season. 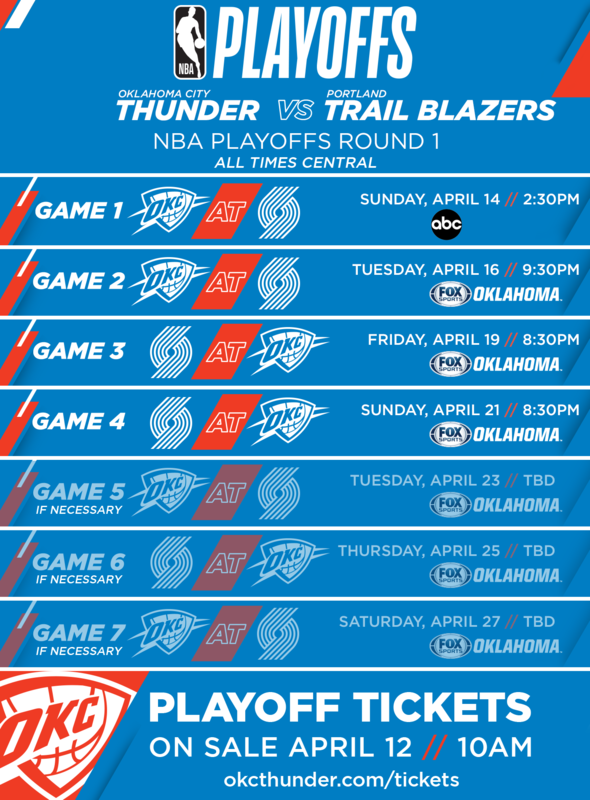 Tickets for all home playoff games will be available from the team and other fans at okcthunder.com/tickets starting at 10 a.m. on Friday, April 12. Only tickets sold through the Thunder website via Ticketmaster.com are guaranteed to be authentic and to ensure your entry to Chesapeake Arena for the game. We highly recommend against purchasing tickets from other sources as they may be fraudulent. All fans are able to purchase guaranteed authentic tickets from Season Ticket Members and other fans through okcthunder.com/tickets, as available. Pricing for resale tickets is determined by the seller, not the team, and includes a 20 percent service fee that will be added to the cost of each ticket at checkout. The ZAXBY'S THUNDER REWARDS ZONE provides fans with a game-day chance to win a pair of playoff tickets in the hours preceding each home game. Online registration opens 24 hours after the announcement of games for each round and closes seven hours prior to tipoff of each game. Winners will be notified electronically four hours before tipoff. Please note that there will be some changes to the Rewards Zone during the 2019 NBA Playoffs. Take a look at the ZAXBY'S THUNDER REWARDS ZONE page for additional details. IF I AM A SEASON TICKET MEMBER, WHEN AND HOW DO I GET MY PLAYOFF TICKETS? Season Ticket Members will be able to access their mobile tickets closely following the NBA Playoff schedule release on Friday, April, 12 at 10 a.m. Season Ticket Members can transfer tickets or post any tickets they cannot use for resale through the Thunder ONLINE ACCOUNT MANAGER or access their MOBILE TICKETS via the Thunder app or mythunderaccount.com. If you are a Season Ticket Member and you have any additional questions, please try our Fan Assist for Mobile Tickets, or contact your personal Thunder account manager at 405.208.4666. Fans can shop for 2019 Thunder Playoffs gear as it becomes available on okcthunder.com/shop, and in-store at the Thunder Shop at Chesapeake Energy Arena, which is open 10 a.m. to 6 p.m. Monday through Friday and from 10 a.m. to 4 p.m. on Saturdays during the playoffs. Unless they are exclusively on ABC, all Round 1 games will be broadcast throughout the region on FOX Sports Oklahoma (Cox channel 1310 in Oklahoma). For home games, FSO game broadcasts will begin 30 minutes prior to tipoff with the “Thunder Live” pregame show from Love’s Thunder Alley. “Thunder Live” will begin 30 minutes prior to tipoff for road game broadcasts as well. Second-round and beyond games are broadcast only via national networks (TNT, ABC or ESPN). First-round games are also available for streaming live via the Thunder mobile app. All games throughout the playoffs will be broadcast on the Thunder Radio Network, led by WWLS-The Sports Animal (98.1 FM in Oklahoma City) and The Sports Animal Tulsa (97.1 FM). WILL THERE BE LOVE'S THUNDER ALLEY? Starting three hours prior to every Thunder home game during the playoffs, the team will hold Love’s Thunder Alley outside Chesapeake Energy Arena on Reno Avenue. The family-friendly pregame festivities will end at tipoff. HOW CAN I KEEP UP ON ALL THE DETAILS? Interested in up-to-the-minute news about the Thunder including playoff ticket information? Please fill out this form and you will automatically receive all of the latest information via Thunder Insider.